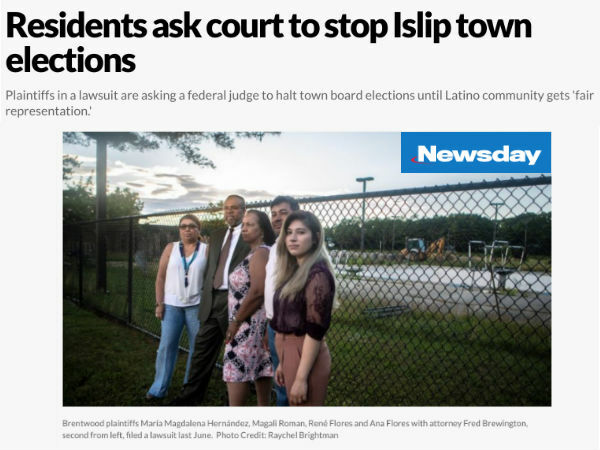 A group of Long Island, NY, residents and community groups are suing to change the way Islip Town Board members are elected. Their lawsuit alleges that the current at-large system prevents the growing Latino population from having equal representation. Social Explorer's Andrew Beveridge helped analyze the demographics for the case and proposed redistricting plans that would include at least one majority Latino district. Newsday reporter Rachelle Blidner wrote about the case and Beveridge's involvement. ...The at-large voting system dilutes votes by Latino residents, who represent about a third of the town’s population but have never held town office, the lawsuit said. Few elected town officials have lived in largely Latino areas of Brentwood, Central Islip or North Bay Shore, even though they are the town’s most populous hamlets. The lack of political power has also led to discrimination and substandard town services in Latino areas, the lawsuit said.